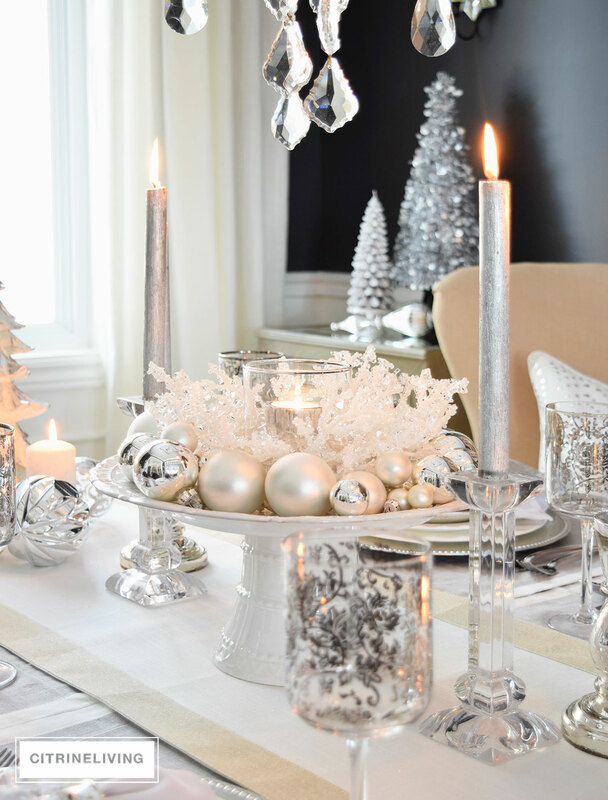 Welcome to the Holiday Tablescape Blog Hop, hosted by Chloe Crabtree of Celebrate & Decorate. I’m thrilled to have you join me today and I’m so happy to be a part of this tour! 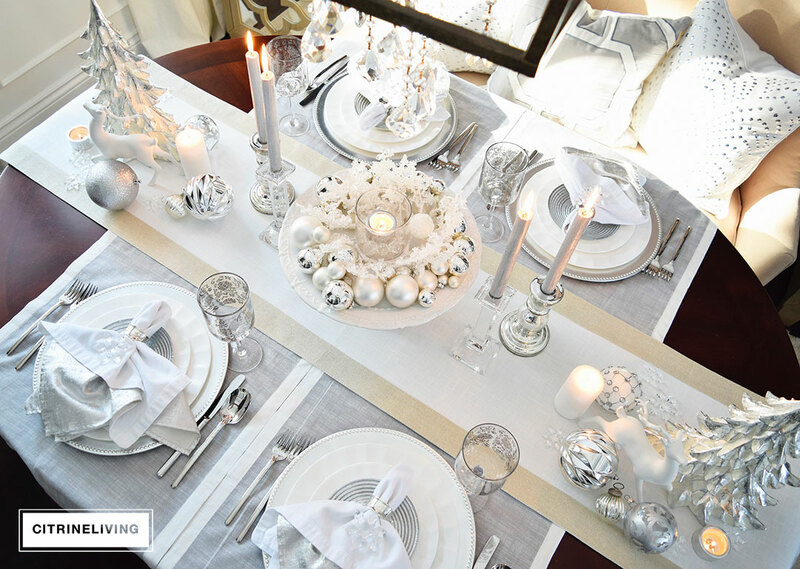 This is my second tablescape/entertaining tour that I’m a part of this week. If you’re new to CitrineLiving, welcome, I’m so happy you’re here. 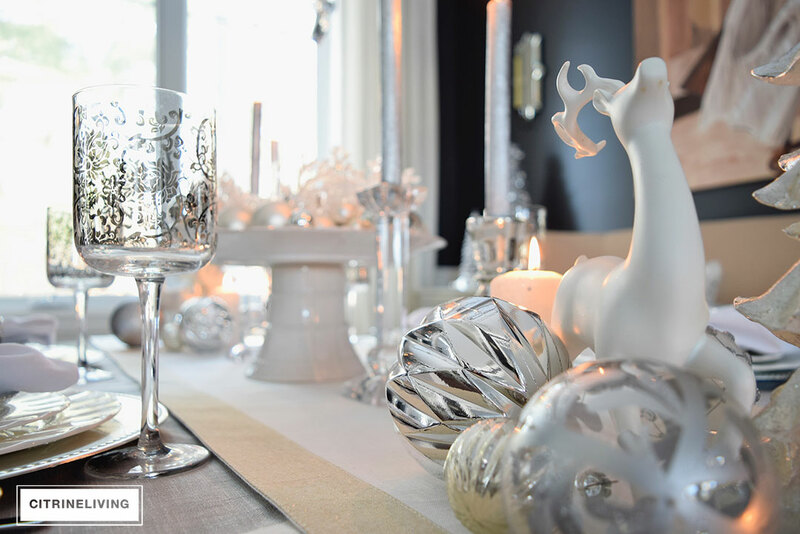 If you’re a regular reader, then you know how much I love to create tablescapes that are interesting, somewhat ‘out of the box’ and personal. 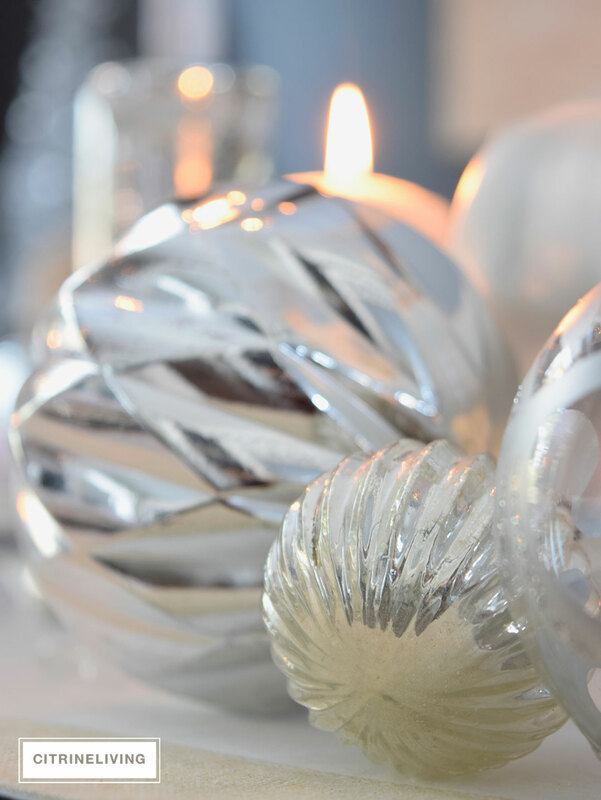 I shared a fabulous red, white gold and table this past Tuesday, which I know you’ll love – you can read all about it here. 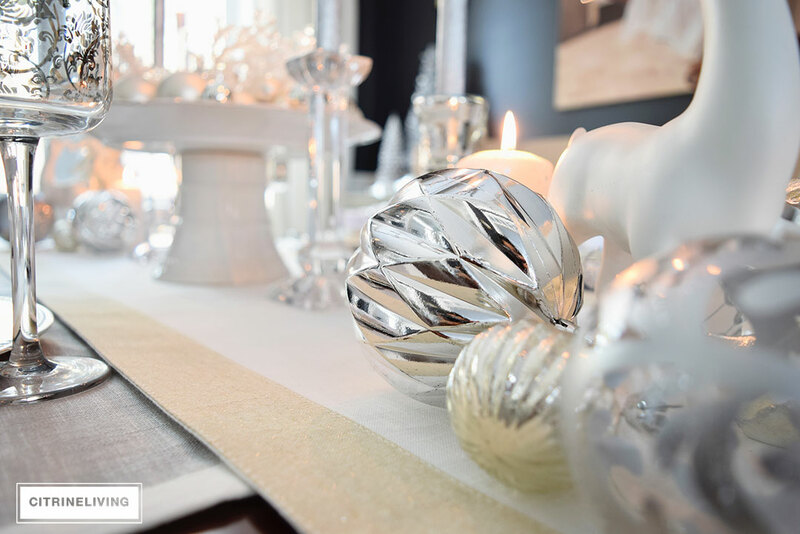 Today I’ll be showing you a winter white and silver holiday tablescape – a more subdued and elegant approach to Christmas. 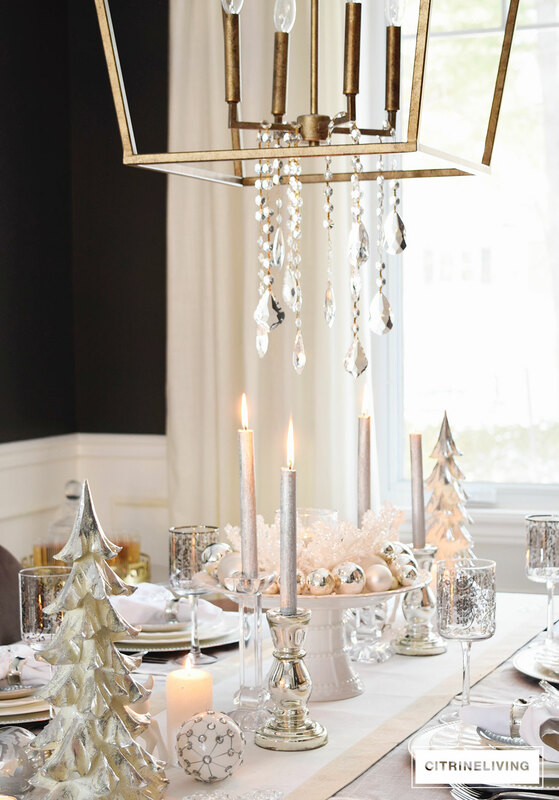 What I love about this table is that you can use this theme for New Year’s as well, since it’s neutral and more ‘Winter focused’. I recently updated this room, which was previously layered with pattern, color and texture. I wanted a neutral space to be able to create tables that wouldn’t compete with the surroundings and to brighten up the room as much as possible. 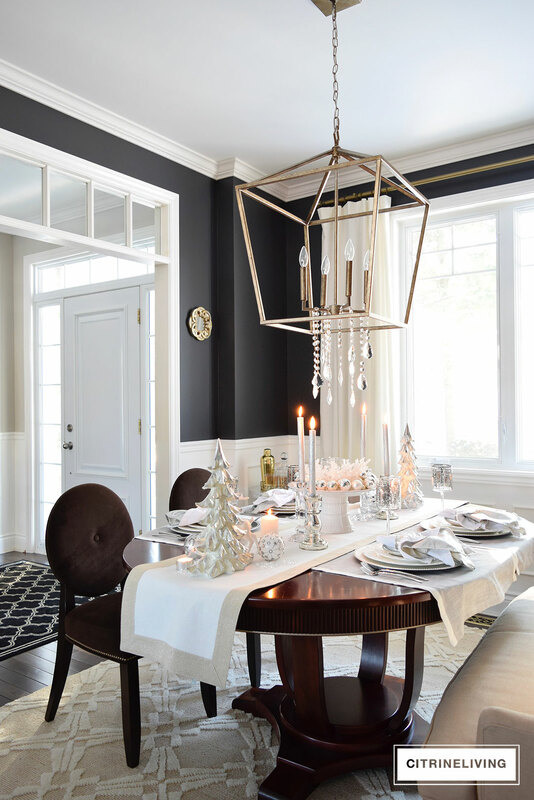 Have a look at our updated dining room here. 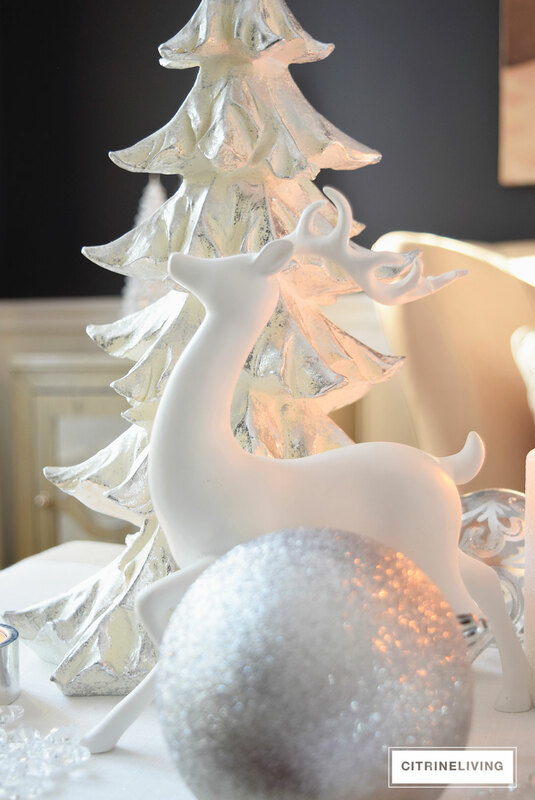 The idea behind this table was a glistening winter wonderland, using reindeer, snowy trees, snowflakes and metallics to create a cool and crisp scene in our dining room. 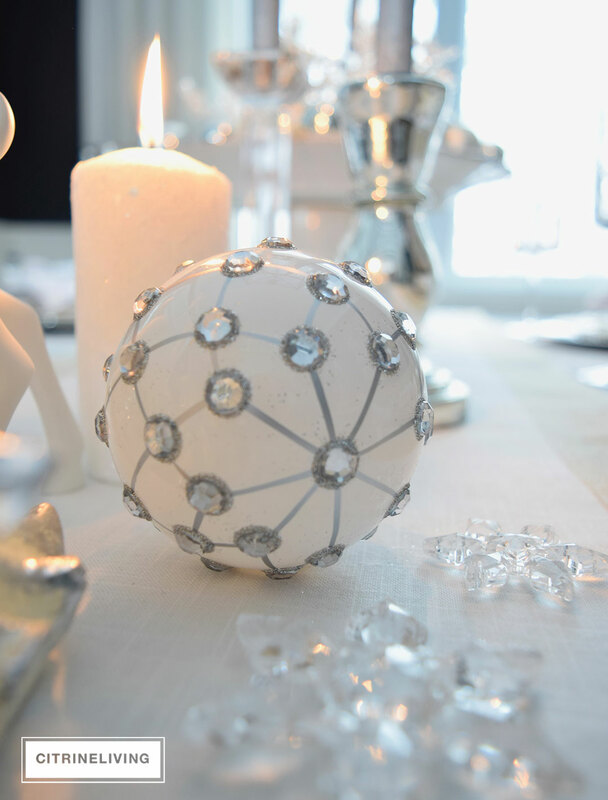 Using a cake stand as the focus of the table, I layered it with a crystal beaded candle holder surrounded by silver and pearl ornaments. 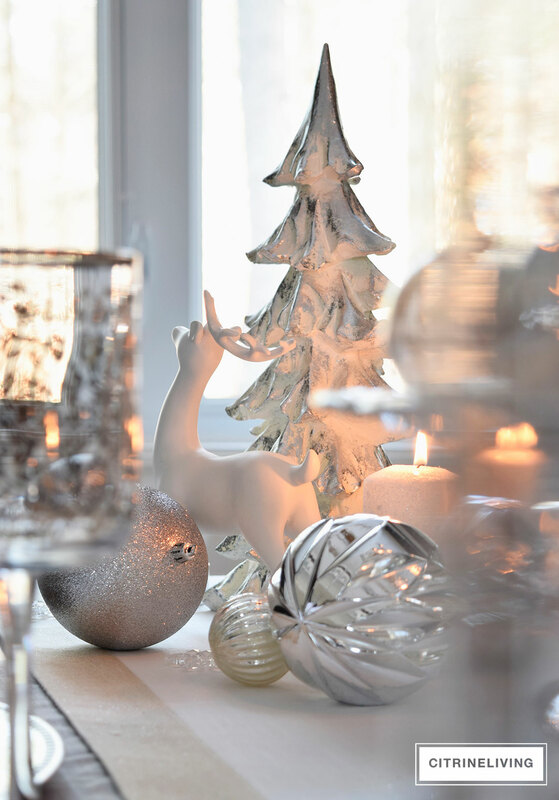 Flanked with some of my crystal and mercury glass candlesticks, which then lead over to a forest-inspired grouping with my beloved white reindeer, snowy trees as well as more candles and ornaments. 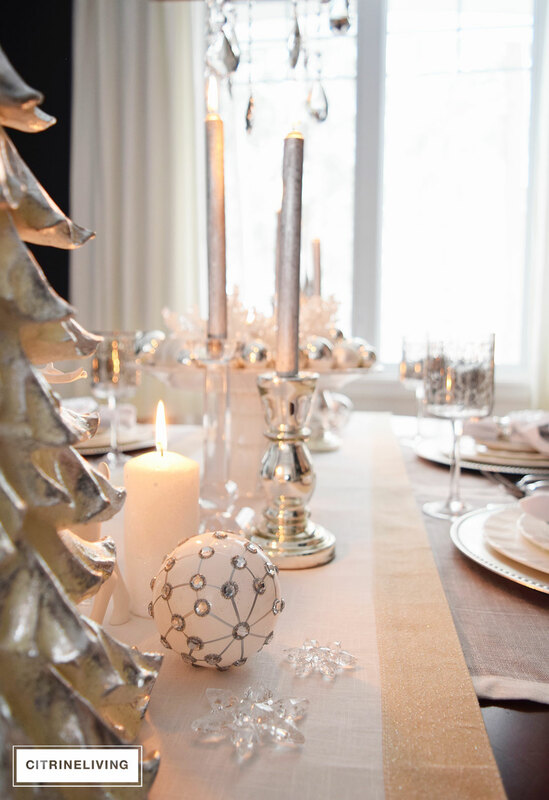 I often layer table runners crosswise for a tailored look. Here, I actually used napkins to create the bottom layer. They’re a nice large size, which covers the table well and I made sure to lay them as close together as possible to hide the table from showing through the center. 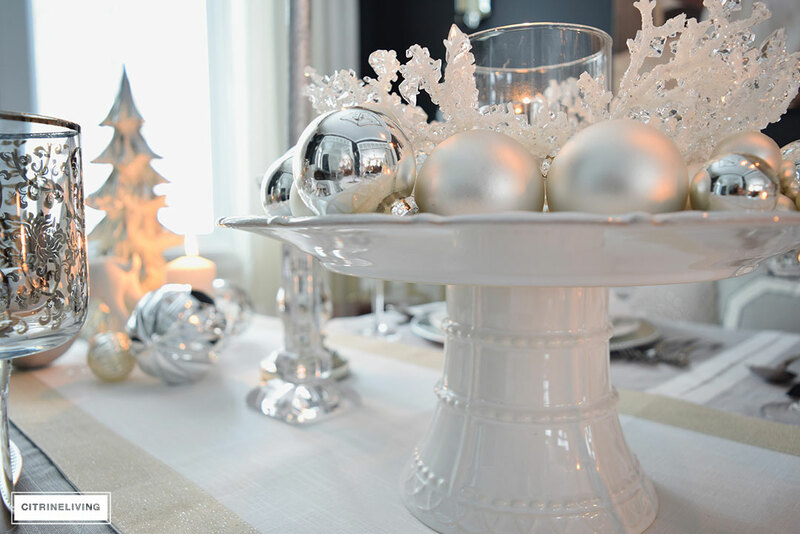 I love to loosely place decorations on the center runner, however notice when you look at the full table, that there is still symmetry happening, which keeps it contained and gives everything a sense of place. More trees and ornaments are displayed atop the side cabinets to reinforce my wonderland theme even further. 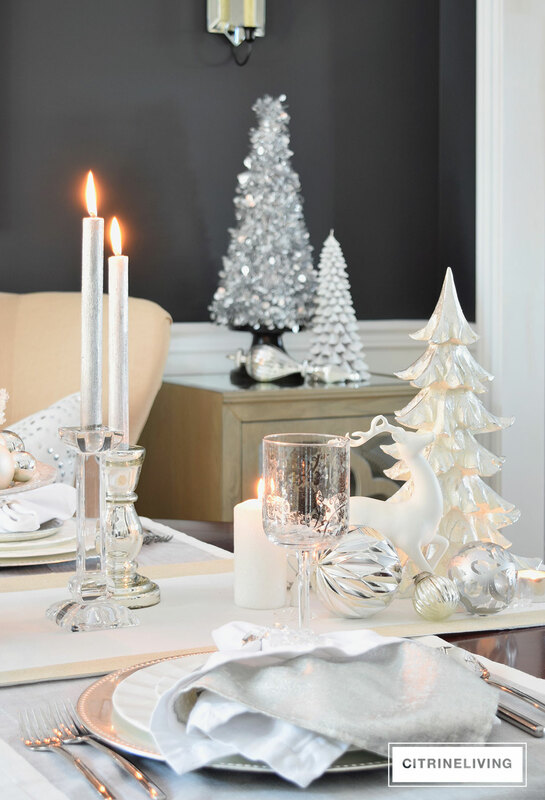 Candlelight is truly magical, especially for the holidays. 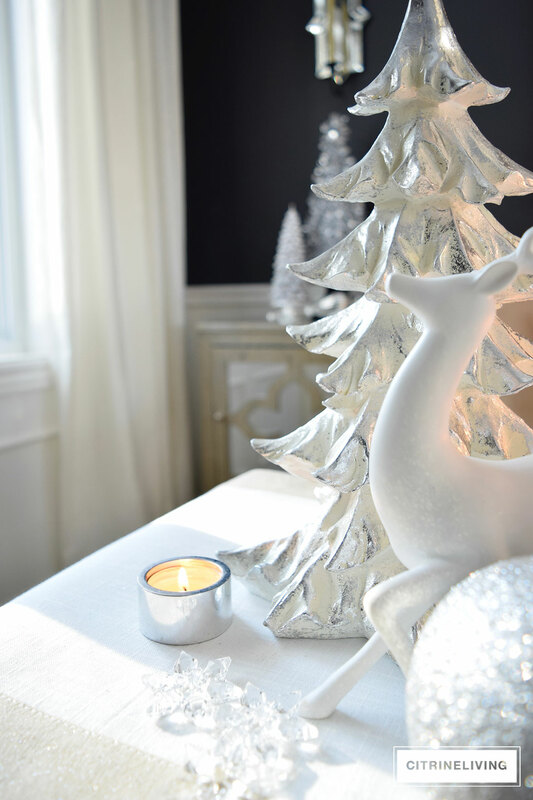 I love how it reflects off of everything on this table and gives it all life. 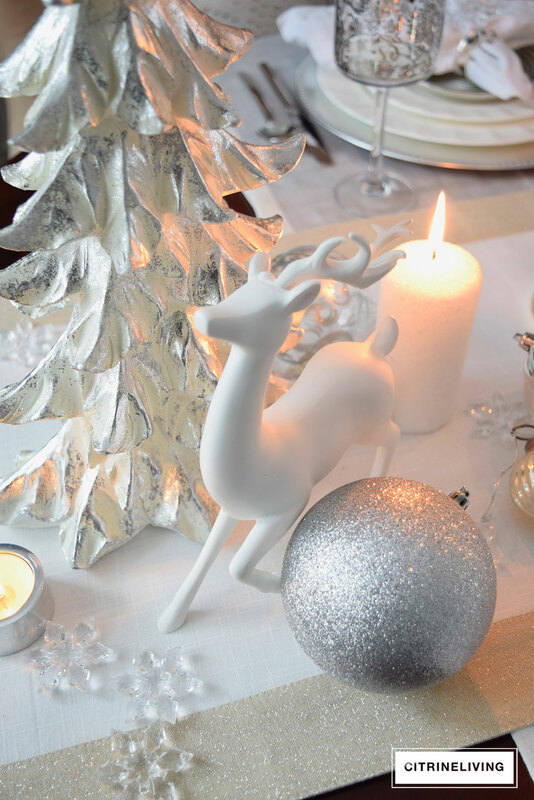 The reindeer and trees are perfect for catching the candelight. 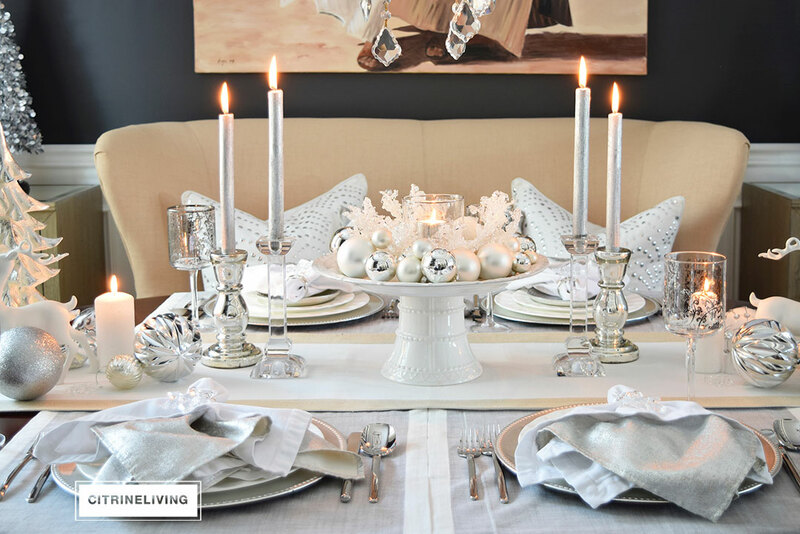 Layering many different textures always adds interest to a table, as well as to any space for that matter. Don’t be afraid of mixing different types together, you may be very pleasantly surprised with the results. 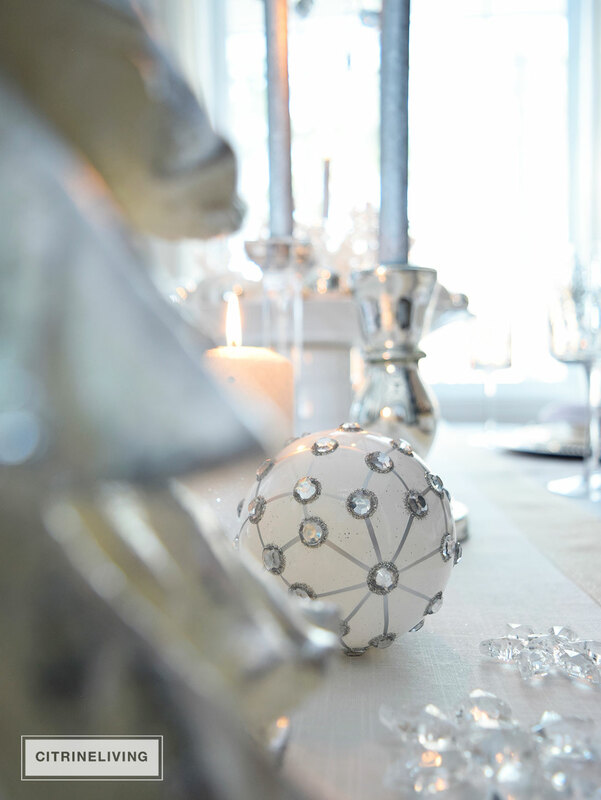 The crystals on the chandelier catch the late rays of sunlight here so beautifully as well, don’t you think? 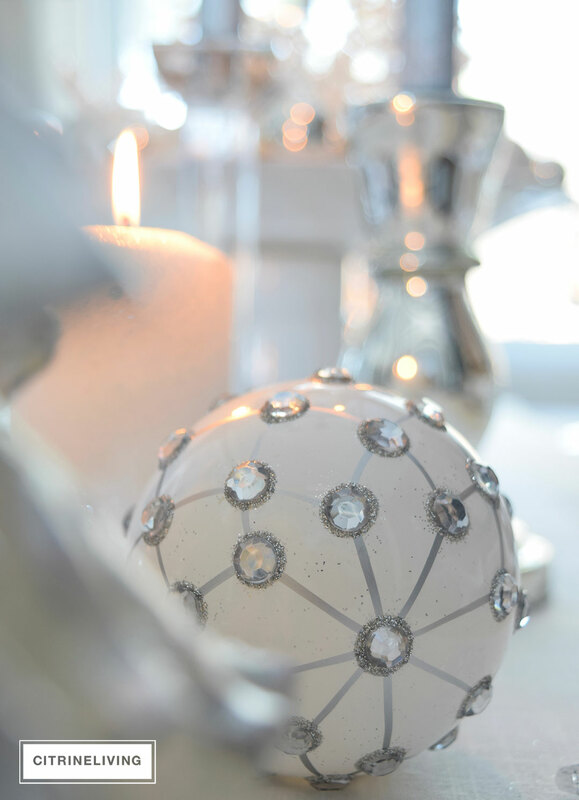 Each place setting is topped with layered white and silver napkins (these are some of my favorite go-to textiles) and finished off with a snowflake for a keepsake for guests to take home. 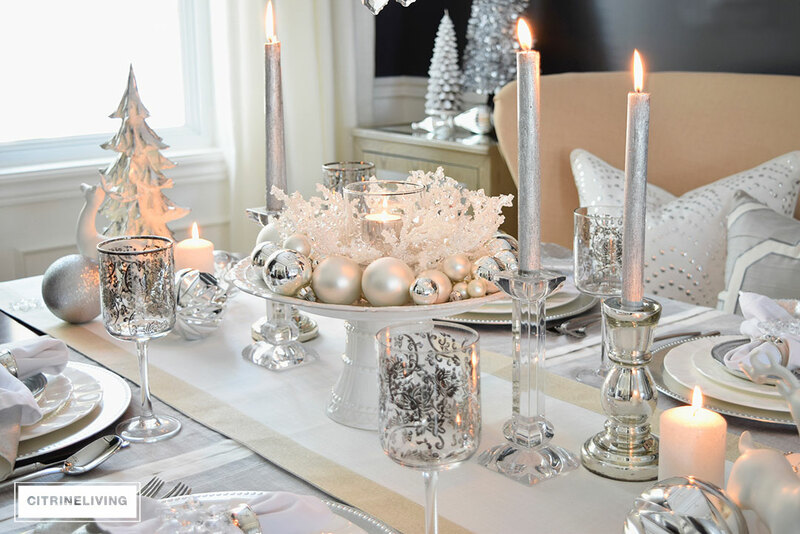 My silver beaded chargers and fluted white dishes (more of my favorites!) 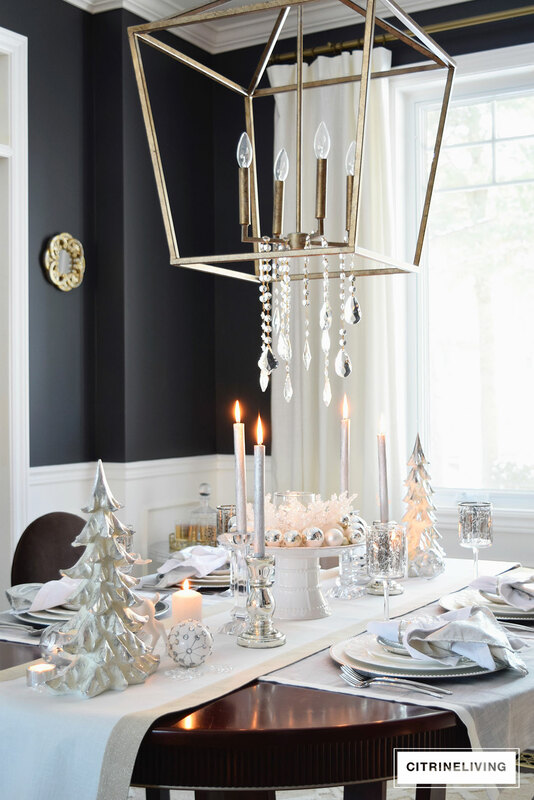 keep the look clean and let the centerpiece stand out. 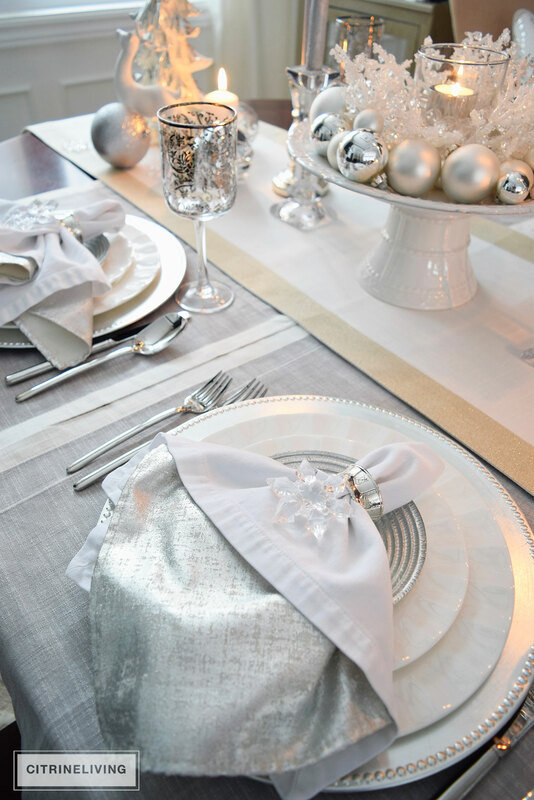 I love the juxtapostion of all that texture against the more streamlined place settings. 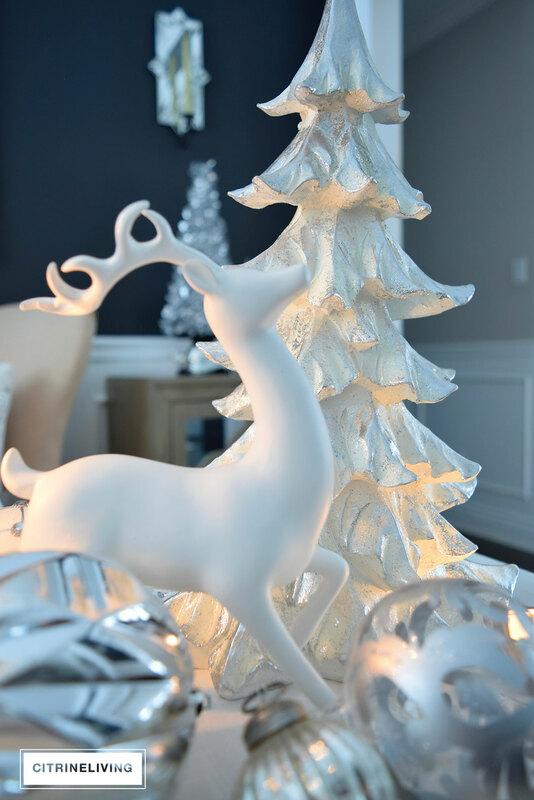 Thank you so much for joining me today, I hope you enjoyed your stay and found some inspiration for this holiday season! Once again, a big thank you to Chloe for inviting me to join this blog hop! Please make sure to visit everyone on the tour, all links are listed below. Happiest Holidays! OUR NEW KITCHEN LIGHTING AND BARSTOOLS ARE ON THE WAY! 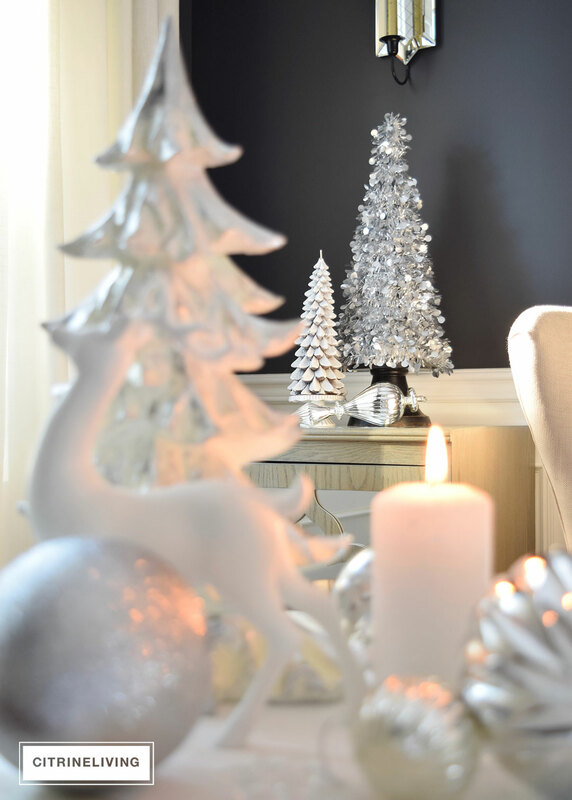 Im dreaming of a white Christmas! I love this so much! Thank you Sarah! I’m so happy you like it! 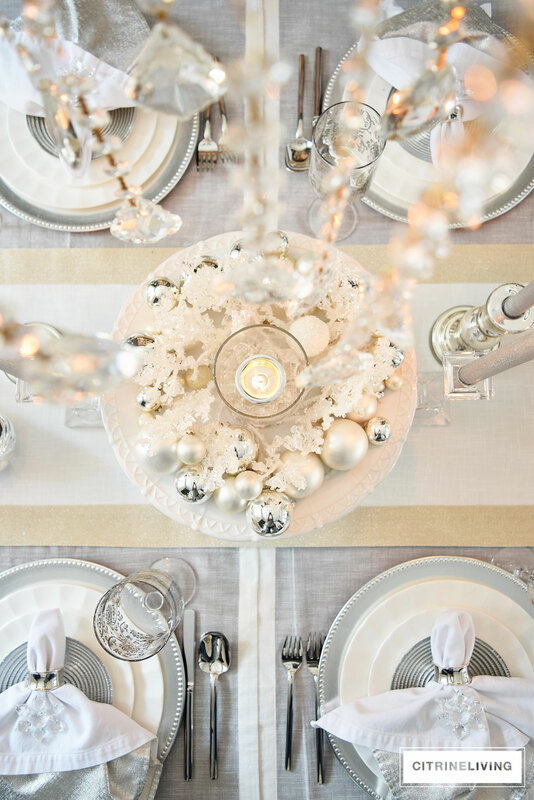 Tamara you blew me away with your gorgeous table! 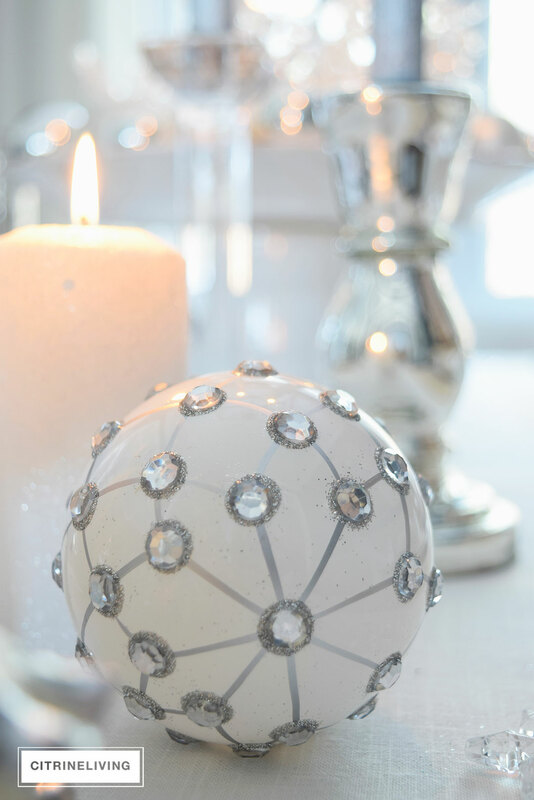 I love all the glossy and touches of silver …but my favorite are those gorgeous white balls! Wow. So pretty. As always, thanks so much for being the wonderful, gracious hostess that you are!